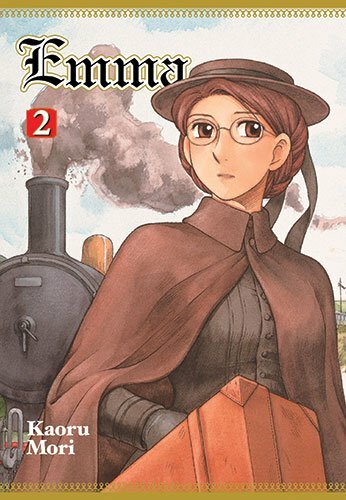 The second volume of Emma starts off where the first volume left off. To avoid causing a scandal in the Jones’s household, Emma leaves for the impoverished seaside town of her childhood. During her train ride, she encounters a maid who is traveling with her mistress. They strike up a conversation and the employed maid suggests Emma apply to work in her mistress’s household. Emma agrees and discovers herself under the employ of a successful German household with a large staff of servants. Perhaps this is the perfect environment for Emma to forget about the love she left behind in London? Emma’s new home contrasts greatly with her previous life; all of the maids and butlers wonder why she left London so abruptly without so much as a letter of recommendation from her previous mistress. Of course, we know the answer, Emma doesn’t freely volunteer why she left London. She also sticks out from the rest of the staff – she’s attractive, she wears glasses, and she can read a little French. Some of the maids wonder if Emma is really a maid. She’s simply too elegant and articulate to fit in with the other servants. This uniqueness does have its benefits – the mistress decides to use Emma as a traveling companion. As a result, Emma gets to meet an interesting, financially independent woman who does not care for socio-economic boundaries. Leisurely travel with the mistress eventually brings Emma back to London, where she ends up at an engagement celebration she least expects to attend. This volume is just as gripping as the first. For a good moment I was a bit worried I wasn’t going to hear anything about Mr. Jones or their household; however, we get just as much face time with them as we do with Emma. A lot of things happen in London while Emma is away that I dare not share with you. You’ll have to read the book yourself! One of the things that does concern me is the commitment around William Jones and Eleanor. As readers will know, the Jones line does not descend from landed gentry. Mr. Jones is not a gentleman but Eleanor is a lady from the landed class. During the late 18th and early 19th centuries, the lines between the emerging merchant class and the gentry were blurring. The impoverished gentry would often marry their sons off to a wealthy merchant’s daughter. This exchange of rank and money was not uncommon. The wealthy daughter would marry an impoverished gentleman for his title and landed status. This did not apply both ways – daughters almost never married outside of the gentry simply for the fact that a man can give his title but a woman cannot. Perhaps this changed during the time that Emma takes place, but I know for certain in the long eighteenth century (the time when Jane Austen was writing) that women took on the rank of their husbands. Why is this important? Well if you recall, a marriage between Eleanor and William is encouraged because the Jones’s want to acquire Eleanor’s social rank. The Jones’s are wealthy members of the merchant class who are socially ambitious. They’re hoping to marry into the landed gentry and cement their place in the higher ranks of society. Assuming my own graduate research applies to the period that Emma is taking place, Mori has mistakenly applied the rules of rank universally to both men and women. Only men could socially elevate women through marriage. In reality, if Eleanor marries William, she will lose her status in society and take on her husband’s. She cannot give William her title simply because she is a woman. Eleanor is actually marrying down if she becomes Mrs. Jones. On the other hand, this fact actually makes a marriage between William and Emma possible. Perhaps Mori intends to use this as a plot twist later on? We’ll just have to keep reading to find out!